Check Rates & Availability at Days Inn Attalla! 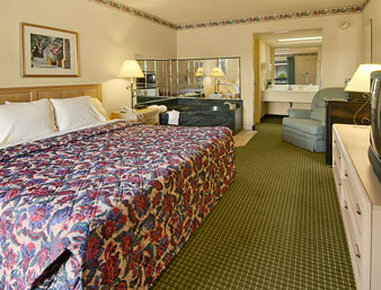 The Days Inn Attalla/Gadsden is conveniently located off of I-59 at Exit 183. We are just minutes Alabamas largest flea market, Mountain Top Flea Market, Alabama International Dragway and the Robert Trent Jones, Bobby Jones, Golf Trail. We are close to Boaz Outlet Shopping and Talladega Nascar Motor Speedway. We would like to extend you a warm welcome to the Days Inn of Attalla/Gadsden. Our friendly staff is awaiting eagerly to serve and make your stay as comfortable as possible. We offer a Complimentary Hot Deluxe DayBreak Breakfast, a business center, free wireless internet, and an outdoor pool shaped like the state of Alabama. Pets accepted for a fee of 15.00 dollars per night. Our Safe Usage Fee Is 1.12 Dollars - 1.00USD Plus 12 Percent Tax. Let us be your place to relax under the bright Alabama sun. Wyndham Rewards where it is fun to get more.